For someone just beginning to learn about this historical subject, it is important to know one thing. There is and was no such thing as an 'Aztec'. The term Aztec was first used in the late 1800s in Europe to describe the collection of tribes present in the Central Mexican Valley at the time Cortez landed. The Mexica tribe was the tribe in power and held sway over the other local Indian tribes in central Mexico. The other tribes hated them. Cortez exploited that hate and used them to form an army to conquer the Mexica tribe. The term Aztec is so well used today that it has been intermixed within this study. Another point to remember is this was not an ancient civilization. The Mexica tribe was a late comer to the area and only cemented their power in the area as a dominant force around the year 1428. The arrival of Cortes and their overthrow in 1519-1521 ended their reign. The time period that the Mexica tribe completely dominated the area and the other Indian tribes, was only about a hundred years. A very short time.....historically. Of interest, when the Mexica tribe 'captured' another tribe, they were only interested in collecting tribute. They did not impose their religion or culture upon the other tribes. This study is focused upon the religion of the Mexica tribe itself, the ruling class at the center of the empire and the city on the lake. The Rome of Meso-America. The following links are presented as research into the study of the transformation of the Aztec religion into modern society. Writings on spiritual beliefs including dissertation on Aztec philosophy. VISIT THE TEMPORAL TEMPLE The Webmaster of this page opens her HALL OF BELIEFS SECTION with the following paragraph: My personal spiritual beliefs can be found in many "religions" and spiritual teachings. I am an eclectic mix and find that my beliefs continue to evolve and grow as I learn more. I believe that we are all spiritual beings, regardless of whether we are "religious". Spirituality is evidenced in tender moments, kind gestures, thoughtful words. We are all part of one whole and our consciousness of those connections with each other is part of that oneness, part of making ourselves whole. In the section MESO-AMERICA, a discussion on the spirituality of Aztec beliefs is presented. Modern interpretation of the representation of Quetzalcoatl A web page making the claim that the Mesoamerican deity Quetzalcoatl was a representation of Western Christian faith. More on this subject area. 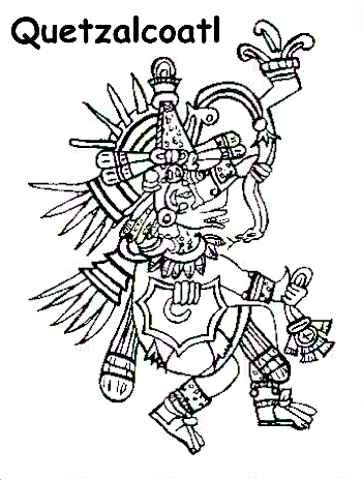 Academic information on the deity Quetzalcoatl. Notes on the Present Status of Ololiuhqui and the Other Hallucinogens of Mexico "Among the remote monolingual peoples of Mexico these plants continue to this day playing their divine role. Whenever the Indian family is troubled by a grave problem, it is likely to turn to one or the other of these plants....." so says the author of this paper from the Botanical Museum, Harvard University.